Plain wet or dry, Jagveld, Safari or Supreme. These are different butchers. Jagveld and Safari have the most fat. Garlic, BBQ, Chilli and Jamaican Jerk are flavoured. Boerewors  all beef traditional recipe  about 500g random. To order call 08009399925 ext 3 or email orders@ontrays.co.nz. Let us know your preference, delivery details,phone number and email address, and for Wellington, orders received before 10.00 am same day delivery. Out of town overnight, south of Christchurch and rural two days. 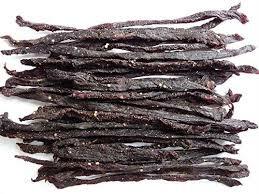 All our biltong is made under contract. We offer the best range and quality. Vacuum packing at no extra charge.